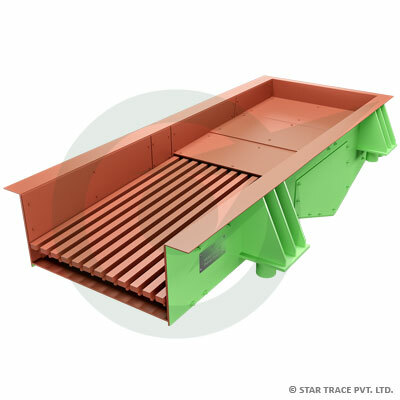 Grizzly Feeder | Nickel Ore Processing | Star Trace Pvt. Ltd. The Grizzly Feeder is suitable to feed primary jaw crushers, selecting the large sizes which require primary crushing, the smaller sizes, and any fines which must be eventually rejected. The Grizzly vibro feeder consists of a very large vibrating body made of thick plate, with inside lining of anti-abrasive plate. The Grizzly vibro feeder is driven by two or four vibrating motors. The vibro feeder which may either be placed on a steel or concrete base rest on springs. A robustly constructed range of vibratory machines extending from units 0.5m wide x 2m long up to units 1.5m x 4.5m. The grizzly feeders are intended primarily for use ahead of primary crushers and are designed to handle large run-of-quarry stone, take the impact of dumped loads and smooth out the flow of material to the crusher. All models of grizzly vibro feeders have a flat reinforced impact area followed by a sloping grizzly bar section. The longer grizzly feeders are fitted with two stepped, grizzly bar sets. Replaceable wear sections of mild steel, manganese steel or rubber are fitted depending on the duty specified.